Heal your marketing strategy with The Ultra Medical Kit! 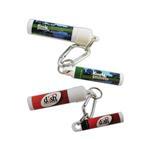 This is the perfect giveaway for your next medical conference or event. 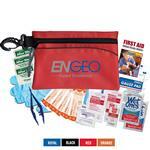 Made with a heavy duty plastic case with handle and hang-holes modeled after a classic first aid kit. Contains twenty-four latex-free adhesive bandages, ten latex-free junior bandages, nine antiseptic towelettes, 7/8 oz. tube first aid cream, four non-aspirin pain reliever packets, four latex-free extra large bandages, tape, scissors*, instant cold pack, 1" x 4 1/2 yrd. conform bandage, reusable forehead thermometer in plastic case and a 40 page first aid booklet. Dimensions: 5-1/2" x 8-1/2" x 3-1/4"
Dimensional Weight for UPS & FedEx: 39.00 lbs.